The 'new man' loves to bake. It's awesome. 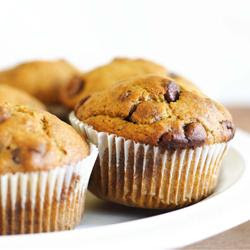 These Pumpkin Chocolate Chip Muffins are a favorite with his family, and he graciously said i could share the recipe before Thanksgiving. Enjoy everyone! In a large bowl, combine the flour, cinnamon, salt, and baking soda. In another bowl, beat the eggs, sugar, pumpkin, and oil. Stir into dry ingredients just until moistened. Fold in chocolate chips. Pour into muffin tin pans. Bake at 350 for 20-30 minutes or until toothpick inserted near center comes out clean. Cool for 10 minutes before removing from pans to wire racks.